A 30 ft.-wide ring flattened around a 30 ft.-wide standing center with a 6-8 ft. long pathway off to one side in full-grown corn (maize), found in a remote 130-acre field NW of Harrisburg. All stalks laid counter-clockwise & many breaks or “cuts” were found in lower stem nodes. 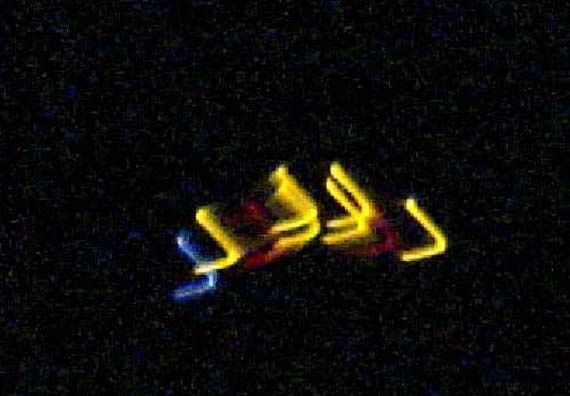 Associated aerial light phenomena also reported in general area. A somewhat irregular 75-foot diameter large circle with 2 pathways (one longer, one shorter) intersecting large circle at right angles, with 5 smaller circles arranged outside one edge of 75′ circle. Corn stalks flattened very tightly to the ground. BLT was unable to determine location & no other details are available. A 140 (+/-) ft. diameter circle in 6 ft. tall sorgum, densely-planted. Farmer reported no pathway in when found, plants bent over (not broken) at base, swirled clockwise. BLT fieldworker reported 2 swirled centers, plants very flat to ground, no compass anomalies, no difference in radiation readings, unusual red streaks on stalks. Three partially flattened areas (20 x 26 ft. oval, a 14 ft. circle, a 7 x 6 ft. oval). Lay chaotic, but mostly to the West. Smaller circles laid across planted rows, larger oval laid across & down rows. No expulsion cavities, compass change or unusual radiation–many stalks bent double & many “cuts” through lower nodes. Approx. 150 ft. x by 128 ft. w/all circles swirled clockwise. The two larger (50′ diam.) end circle center-swirls were offset to the East by several feet. Soil in all swirled centers was rock-hard & dry. All plants were same height and some were broken at the base & dead. If mechanically flattened one would expect the majority to be dead. Multiple circular rings, ranging in size from 7-8 ft to 30 ft. diam., caused by plants being both 4 inches taller and much greener than surrounding grasses in field. Local residents report ongoing UFO activity over several years, with similar green rings found afterward. These may be fungus rings but no fieldwork was conducted. A fairly large somewhat circular area of marsh reeds flattened and swirled around multiple standing “tufts” throughout. This marshy area abuts a protected wildlife sanctuary. Clear bending of thick plant bases photographed & some plant leaves show unusual “crimping” along both edges. Location not divulged, so no fieldwork conducted. “Unusual aerial lights” reported in area on July 30th & 12 variably-sized circles found a few days later, all flattened counter-clockwise. BLT fieldworker estimates plants downed for 2-3 weeks; no compass anomalies, magnetic material in soils or abnormal radiation found. Mix of dead & healthy plants inconsistent with mechanical flattening. Two large areas of very dried out 4-1/2 ft. tall millet flattened tightly to the ground, in no obvious design. Bending at base of plants & standing clumps seen throughout browned areas; rest of field green and apparently healthy. Farmer attributes damage to drought. Fieldworker reported his new batteries went dead after 30 photos. Probably occurred about 1 week earlier when a power-outage blacked out the area. Farmer cut field after circle was found by local pilot. BLT fieldworker saw no compass anomalies, no EM or other abnormal radiation, no magnetic particles in soil. Her cellphone did fail & she repeatedly heard a very odd “crackling” sound while in the circle. Two side-by-side circles (approx. 20 ft. in diam. ), each of which had an outer ring of standing crop that was taller w/much larger seedheads than in the rest of the field–these plants tapering down to shorter standing plants in the centers, thus creating two “bowl” shapes, instead of flattened crop. Soil samples showed no unusual fungi. Two areas of partially-circular, partially randomly-downed grasses. Bad storm with lightning the night before damage was discovered. Field is near a limestone quarry and an old Indian site, and resident reports she has seen light-balls in the area with some frequency and that her camera would not work in downed areas of field. Finally, an eyewitness’ photo of an approximately 5 ft. wide “kite-shaped” UFO seen by several people above the famous East Field at Alton Barnes, Wiltshire, where dozens of crop circles have occurred over the years.